In normal years, the United States manufactures about 12,000,000,000 “tin” cansâ€” cans of sheet iron or steel coated thinly with tin for protection against the atmosphere and food acids. Millions of iron and steel kitchen utensils are similarly coated. Candy bars, other foods, and a variety of products before the war were protected by thinly rolled sheets of tin foil. Tubes of thicker sheet tin form containers for toothpaste, shaving cream, and medical products. Solder, babbitt, type metal, pewter, bronze, bell metal, and gun metal are all alloys containing tin. Tin compounds are used in chemical manufacture and analysis and in the processing of textiles. 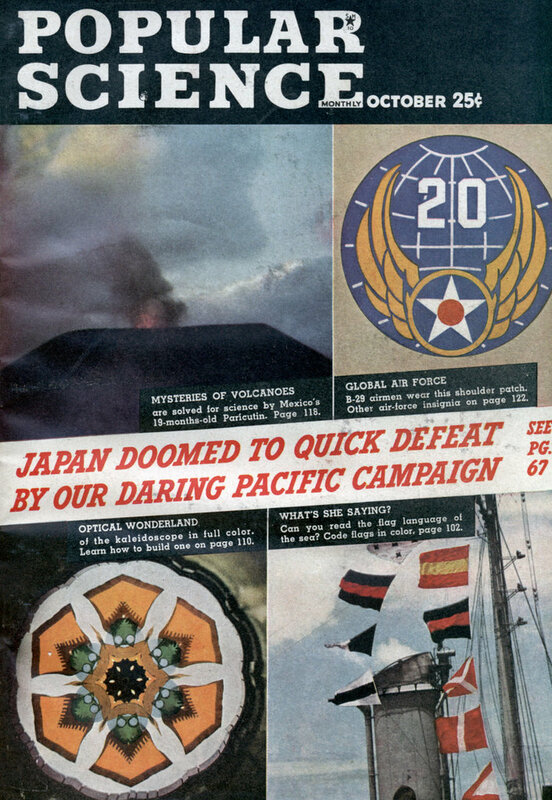 When the Pacific war cut off most of our supply of tin ore, which had come from the Malay Peninsula and the Dutch East Indies, scrap drives and the disappearance of tin foil and tinware made Americans suddenly aware of the importance of tin. Perhaps the commonest use of tin is in plate, of which the tin can is the most familiar. In tin plate, the iron and steel keep the cost low and give strength, while the tin provides protection from air, moisture, and weak chemicals and gives the plate its bright surface. A standard method of tinning is simply the dipping of a cleaned sheet of smooth iron or steel first into a flux and then into a pot of molten tin. The coating of tin adhering to the metal sheet when it is withdrawn is thin and uniform. 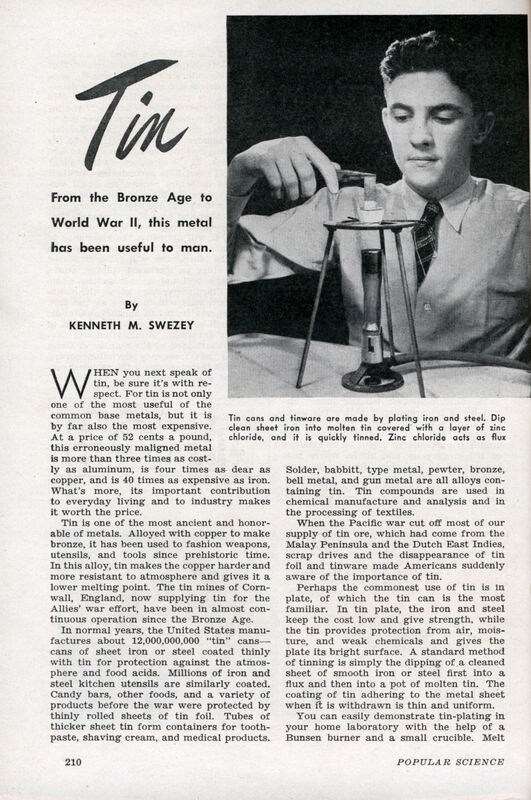 You can easily demonstrate tin-plating in your home laboratory with the help of a Bunsen burner and a small crucible. Melt bits of scrap tin foil or toothpaste tubes in the crucible until it is about two-thirds full. As tin melts at 232 deg. C.â€”the lowest melting point of any of the common metals except mercuryâ€”the fusion is simple. After all the tin has been melted, lower the temperature so that the tin is kept just above the melting- point, and then add a layer of zinc chloride to a depth of about 1/8″. If the temperature of the tin is too high, the zinc compound will vaporize and give off dense, annoying smoke. Cleanse a small strip of iron or steel by immersing it for a few seconds in dilute acid and rinsing in water. Now, holding one end of the strip with tongs or forceps, dip it slowly into the crucible and withdraw it just as slowly. Rinse and wipe the strip, and you will find the end coated with a bright plating of tin. That tin cans are mostly iron can be proved by cutting out a small piece, putting it in a tumbler or beaker, and pouring over it a few milliliters of concentrated nitric acid. After the metal has dissolved completely, fill the glass with water to dilute the acid and the metallic salt it contains. The yellowish-brown color of this diluted solution is one clue that it contains iron, but you can get definite proof by adding a few drops of potassium thiocyanate solution, which will turn bright red, indicating the presence of iron in the piece of “tin can.” If you have apparatus sensitive enough to detect the exact quantities of metals in a tin can, you will find that it contains at least 98-1/2 percent iron and less than 1-1/2 percent tin. When tin cans rust, it is because the surface tin has become broken, exposing the iron beneath to attack from oxygen. Tin foil and toothpaste tubes that have been rinsed clean are a good source of tin for home experiments. By improved methods of plating, effective scrap recovery, and reopened sources of tin supply, the Government has caught up on its wartime tin needs, so these materials are not as critical as they have been. Remember, however, that all foil and tubes are by no means tin. Both products are now made of pure tin, a tin-and-lead alloy, lead, and aluminum. For food and cosmetic packaging, the material is generally pure tin or aluminum. If you can’t distinguish between these two metals by weight or appearance, hold a piece of foil or tube in the flame of a match. Tin foil will melt readily, while aluminum, with a much higher melting point, will not. One method of salvaging tin is to treat old cans with dry chlorine gas, which unites directly with the tin, producing a heavy liquid that drips off. This is stannic chloride, a chemical used extensively in processing textiles. It can be decomposed into tin and chlorine if these materials are more desired. You can demonstrate this interesting reaction by means of the simple apparatus shown in one of the photos on page 211. Chlorine is generated in the flask at the left in the photo by adding a little hydrochloric acid through the thistle tube to chlorinated lime mixed with water. Gas passes through the connecting tube into the test tube, which contains a cleaned, bent strip of tin cut from a can. The pinchcock on the rubber outlet tube leading from the test tube is left open until the test tube is filled with chlorine, and then it is closed. In commercial practice, chlorine is carefully dried before contact with the scrap tin plate because even slight moisture would rapidly corrode the iron of the cans. For our experiment, however, this is not necessary. The change that takes place is clearly visible. After short contact with the chlorine, the tin noticeably darkens, and after longer exposure, it disappears completely and drops of tin chloride condense on the inside of the test tube. Strange as it may seem, the combination of the gas, chlorine, with the metal, tin, produces a water-clear liquid that contains no water whatever! In fact, if a little water is mixed with this liquid, it becomes a solid! After the chlorine has completed its reaction with the tin in your test tube, you can test for this stannic chloride by lowering a bit of wet cotton wool into the tube. Stannic chloride unites with the water vapor, producing a cloud of white fumes. In World War I, the reaction of stannic chloride with the water vapor in the air was the basis of one type of smoke bomb. Stannous chloride, another important tin compound containing more tin and less chloride than stannic chloride, is made by dissolving tin in hydrochloric acid. You may make it in a test tube by dissolving as much tin as you can in a few milliliters of warm, concentrated hydrochloric acid. To produce it in crystalline form, dilute the resulting solution and pour it into a glass dish to dry. Pure stannous chloride makes a clear solution. If a solution of the crystals is whitish, it is due to insoluble tin oxy-chloride produced by chemical reaction with the air. It may be cleared up by adding dilute hydrochloric acid drop by drop. Among other things, stannous chloride is a powerful reducing agentâ€”a chemical capable of robbing compounds of oxygen, chlorine, and other elements. In this capacity it is used in the manufacture of chemicals, dyes, and medicines, and in chemical analysis. You can test this property visibly with a weak solution of mercuric chloride (POISON: be careful!). Pour some dilute solution of stannous chloride slowly into a test tube containing a little of the mercuric chloride solution, shaking the tube as you do so. The white precipitate that forms is mercurous chloride, or calomel. Continue to add stannous chloride, however, and even the calomel is transformed, the white precipitate changing to a dark-gray suspension of finely divided metallic mercury. To bring about these two interesting reactions, the stannous chloride first steals one atom of chlorine from the mercuric compound, and then it steals the other. In doing so, it changes itself into stannic chloride, a tin compound containing two additional atoms of chlorine. The precipitate of metallic mercury formed in this experiment soon settles, and the solution of stannic chloride above it can be used to demonstrate one of the applications of this chemical in the textile industry. Soak a piece of unsized cloth in the solution, and then dip the cloth into a solution of household ammonia for several seconds. The reaction of the ammonia with the stannic chloride precipitates a new compound, stannic acid, on the fibers of the cloth. Drying the cloth converts the stannic acid into insoluble stannic oxide, which will not wash out. This oxide acts as a mordant, enabling the cloth to absorb some dyes better than before, and if applied heavily enough, renders the cloth fire resistant. Silk materials are often given different handling qualities, and made as much as three times heavier, by “weighting” them with a tin compound of this nature. HYDROGEN for your home-laboratory experiments can be generated from bits of an old kitchen pot or other scrap aluminum and common lye in two tin cans set up as shown in the drawing. For this modified Kipp generator have one can small enough to telescope into the other and leave room for pouring in a lye solution. Notch the smaller can, as shown. Make a tightly fitting disk of wire screening, and cut a hole in the screening just large enough to take a bent glass tube. Fit a rubber tube equipped with a pinchcock over the end of the glass tube to lead into the vessel in which the gas is to be collected. Put aluminum scraps in the smaller can, insert the screening and bent tube, invert this can in the larger one, and hold it down with a weight. Close the pinchcock and pour the lye solution into the larger can until it is nearly full; then release the pinchcock to force out the air. Be sure all air has escaped before collecting hydrogen in any quantity, for the two combined will explode when ignited. As a test, collect some in a test tube filled with water and inverted in a dish also containing water, and light it with a taper. If the gas pops, air is still present. Boy, this article has ‘me’ written all over it! I love these old articles that just assume you can go buy mercuric chloride and other exotic chemicals. (I always have go next door to the meth lab to borrow a beaker-full). How to prepare tin chloride.